EMERY, a Southern California-based e-mobility company, is set to launch the world’s first 3D printed eBike, the EMERY ONE, at the Sea Otter Classic in Monterey, California, on April 11th, 2019. The EMERY ONE is born from the collaborative efforts of Franco Bicycles, a leading provider of high-performance, built-to-order road and gravel bikes, and AREVO, the Silicon Valley company that is redefining the global composites manufacturing sector through 3D printing. Every EMERY ONE is powered by Bosch, the industry leader in premium eBike drive systems. Aside from the potential to disrupt personal mobility, the EMERY ONE is disrupting the way bicycles are traditionally manufactured via 3D printing. EMERY ONE frames are in production now at AREVO’s new facility in Milpitas, CA, with all finishing and assembly operations happening at EMERY’s Southern California headquarters, keeping production and logistics onshore. At the Sea Otter Classic in Monterey, April 11 – 14, 2019, EMERY exhibited the new EMERY ONE eBike and various builds. 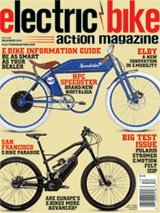 The EMERY ONE will launch with a Founders Edition in limited quantities and will be sold direct-to-consumer via emerybikes.com. Complete bike pricing will start at $5,500, with a Founders Edition starting at $7,500, limited to 100 EMERY ONEs. The reservation window opens on April 11, 2019.